Health professionals at the University of Minnesota's Academic Health Center (AHC) have a long history of making important discoveries impacting the health of people, animals and communities worldwide. How the University can build on its current strengths and further enhance its national and international stature in the health sciences will be the focus of a work session by the U’s Board of Regents when it meets March 30-31. AHC leaders in dentistry, medicine, nursing, pharmacy, public health and veterinary medicine will share key highlights and strategic priorities. The presentation will emphasize how being part of one of the nation’s most comprehensive AHCs increases competitiveness and prepares students to work effectively in a team-based, patient-centered, interprofessional setting, a critical component in today’s evolving health care environment. Earlier this month, U.S. News & World Report ranked the U’s College of Pharmacy as the second best pharmacy school in the country and the School of Nursing 12th among all nursing graduate schools. Researchers from the School of Public Health are tracking the latest infectious disease outbreaks, changes in the health insurance industry and other important topics. Nearly three-quarters of Minnesota's dentists are trained at the U, which is the top dental provider for uninsured and working poor people in Minnesota. The School of Dentistry operates 15 outreach clinics across the state and the nation's first dental therapy program. U faculty across several disciplines, including veterinary medicine, led efforts last year to stop the spread of avian flu. The U’s Veterinary Diagnostic Lab completed more than 5,000 avian flu tests and a new Veterinary Isolation Lab and Poultry Testing Lab are under construction. Last year’s $30 million investment in the Medical School by the Governor Mark Dayton and Minnesota Legislature is equipping the University to better address the state’s most pressing health care needs. In all, the U of M trains 75 percent of the health professionals working in the state. Regents will also review and discuss an update on planning efforts to develop a grand challenge research and training program focused on understanding and mitigating the negative impacts of aging. 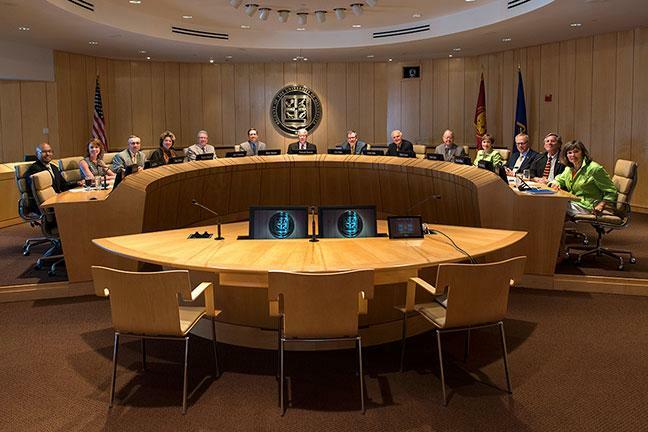 A resolution to support a five-year undergraduate enrollment plan for the Twin Cities campus will be voted on by the Board. The plan, reviewed in detail at the Board’s February meeting, aims to grow and maintain the quality of undergraduate students, while providing an exceptional academic and student experience on the Twin Cities campus. Discussions at Board work sessions in October and December 2015 influenced the plan, which addresses one of the Board’s 2015-16 priorities. Similar enrollment plans will be developed for each system campus. discuss the FY2017 budget framework. Fixed, variable and strategic costs and investments, resource options and key questions related to the development of preliminary budget assumptions will be discussed. This framework will inform the development of the FY17 operating budget for the University. act on a new system-wide operations leadership structure, which will align the finance and operation functions to foster collaboration, create greater efficiency and effectiveness, and reduce the number of direct reports to the president. review the Morris campus’ strategic plan. Chancellor Jacqueline Johnson will outline key elements in, and accomplishments associated with, the UMM strategic plan and connections between the Morris and Twin Cities campuses’ strategic plans. This is the first in a series of strategic planning presentations from system campus leaders. hear from student representatives to the Board. In their annual report, the students will discuss mental health resources, retention and attraction of students and faculty of color and transfer student experiences. recognize standout faculty members. Eight junior scholars who have been selected as McKnight Land-Grant Professors will be formally honored. Each was chosen for their potential for important contributions to their fields of study. There are no committee meetings on Wednesday, March 30. Regents will instead host a breakfast with state legislators, take part in the health sciences work session and visit the College of Science and Engineering (CSE) to learn about current research projects, student achievements and facility upgrades.